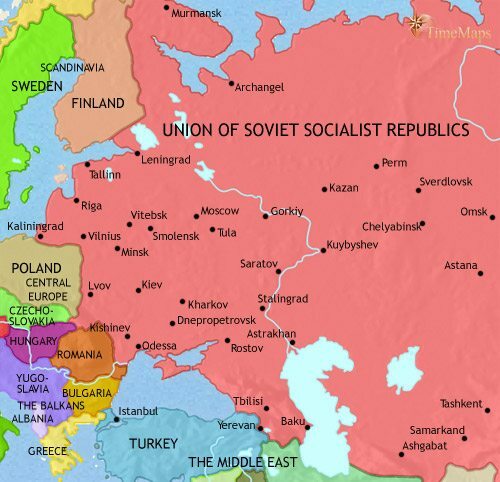 The Soviet Union has now been replaced by a group of newly-independent countries. 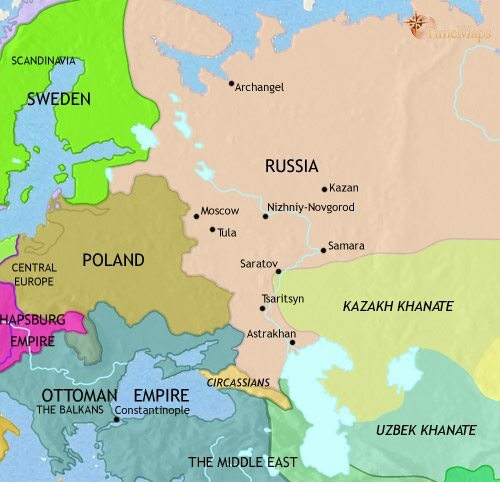 The Khazars dominate the Ukrainian steppes. 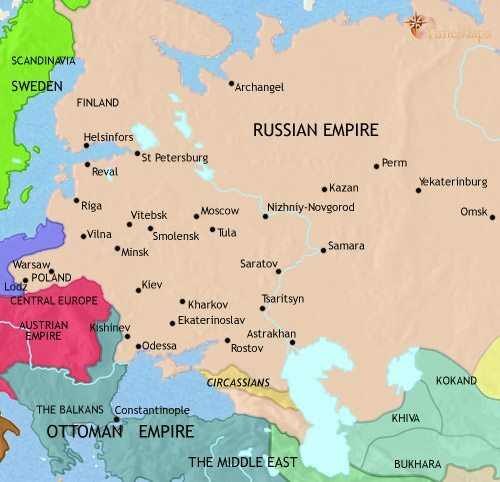 The huge new state of Rus has been formed by the descendants of Viking traders. The Russian state fragments into separate principalities. The Russian states have come under the control of the Golden Horde. The Russians have freed themselves from the Golden Horde and have expanded far into Siberia. Rulers such as Peter the Great and Catherine the Great have been modernizing Russia. Russia emerged from the Napoleonic Wars as one of the great powers of Europe. Revolutionary ideas are spreading fast in Russia. Defeat at the hands of tiny Japan have highlighted the need for change in Russia. Russia is now under the control of the communist party. In the 1960’s the Cold War with the USA and its allies remained intense, and after a few years of thawing relations, a renewed – and unaffordable – arms race with the USA, coupled with economic stagnation and a disastrous invasion of Afghanistan, undermined the Soviet Union’s morale. Finally, Mikhail Gorbachev came to power in 1985. He pursued policies of ‘glasnost’, liberalising public life, and ‘perestroika’, economic restructuring. The reform movement that Gorbachev initiated gathered pace under his successor, Boris Yeltsin. The Communist Party was disbanded, and the constituent republics of the Soviet Union declared their independence. A whole host of new nations appeared on the map. The western-most of these, the Baltic States, welcome democracy and are themselves welcomed into the EU and NATO. Other ex-Soviet states have retained authoritiarian regimes. The sudden introduction of a market economy to Russia led to severe economic contraction and social stress, but in recent years the huge country has been set on a path to economic and social recovery. 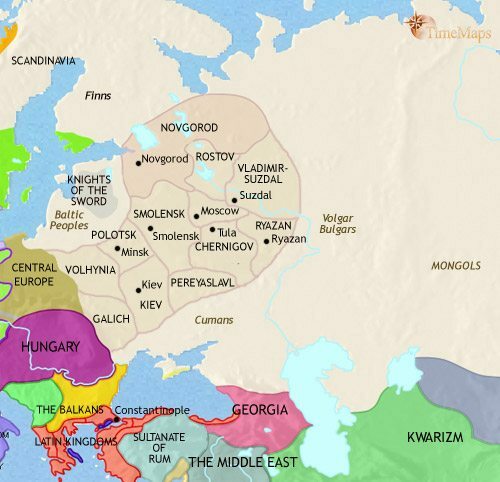 The Khazars, a semi-nomadic people of the steppes, created a loose confederation of peoples covering a large area of the Ukraine. 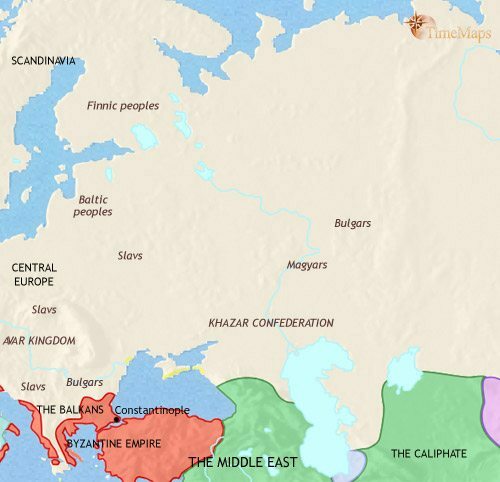 By the mid-8th century this confederation was at the peak of its power, with the Khazar rulers exercised loose authority over a large though ill-defined area to the north of the Black and Caspian Seas. The comparative stability that their authority imposes allowed trade to flourish, much of it in the hands of Jewish merchants. These exercise an important influence with the Khazar court, which, at around this time, converts to Judaism. Two other peoples of the steppe are the Magyars, who at this time pay tribute to the Khazar rulers, and the Bulgars. These latter have been defeated by the Khazars and been split into two main groups. One of these has headed south-west towards the Balkans, where they will play an important role in the history of that region. 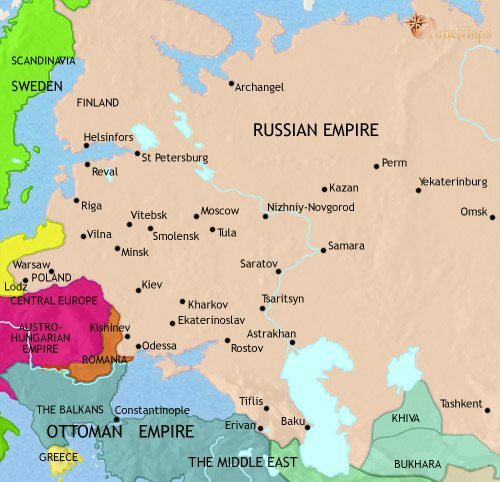 Scandinavian traders, seeking to secure the trade route from the Baltic to the Black Sea, established settlements along the great river systems of Russia, or captured already established Slav towns (such as Kiev). From these bases, they won control over the areas surrounding the towns, and formed principalities. One of these, Novgorod, assumed a pre-eminent position under its ruler Rurik. He even led an expedition against Constantinople itself in 860. Later, Oleg of Novgorod won control of Kiev, thus founding the state of Russia. In this state, the Rus (Scandinavians) are a warrior and merchant elite exercising a loose authority over the surrounding Slav communities, from their small, fortified towns. One of the first acts of the new Rus rulers of Kiev was to attack the Khazars, whose large confederacy of steppe peoples immediately fell apart. They were replaced as the leaders in the region by the Pechenegs, a much more aggressive and militaristic people. One group which fell foul of their aggression was the Magyars, on the River Don (892). The Magyars have therefore followed earlier steppe nomads by heading west into Europe, where they will in due course found the kingdom of Hungary. Vladimir, grand prince of Kiev, was converted to Christianity by Byzantine monks (988). This conversion was followed by a period of political stability and cultural creativity under Iaroslav the Wise (1019-54). The Byzantine church introduced the Slavic (Cyrilic) script and, along with its faith, brought its distinctive literature, art and architecture. The huge area of the Kievan state made it difficult to govern from one centre, and power became fragmented amongst different members of the royal family, with each governing a separate principality. 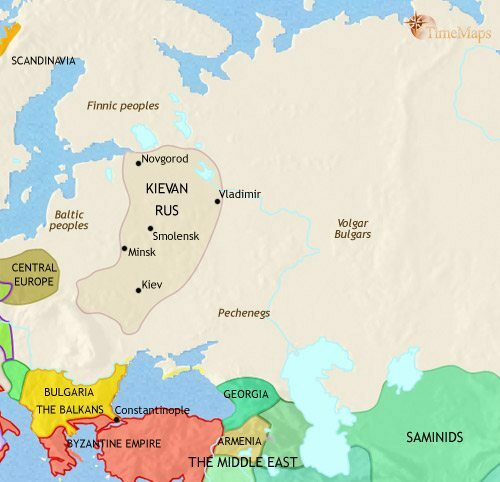 Kiev itself was sacked by the warlike Kipchak nomads (1093) and the centre of political and cultural life in Rus shifted further north, away from the steppes. By this time the original Norse elite had intermarried with the surrounding Slav peoples and adopted Slavic names and language. Even the kings soon came to have Slav names. In 1126, Novgorod declared its independence from Kiev and became a republic. Novgorod is a flourishing commercial and cultural centre, as well as being a powerful military state in its own right. The Russian principalities were devastated by a massive Mongol invasion in 1242. The city of Kiev was completely destroyed and all the principalities were incorporated into the Mongol empire, as tribute-paying vassals. Only the Republic of Novgorod was able to resist. Novgorod, with its huge hinterland, has continued to flourish by developing strong trading ties with western Europe. In the second half of the 13th century the Mongol empire divided into several branches, with the Mongols of the western steppes becoming known as the Golden Horde. The khan of the Golden Horde continues as overlord of the Russian princes. Since the mid-14th century the princes of Muscovy have acted as intermediaries between the khan and the other princes, and by the mid-15th century they have established themselves as the effective leaders of Russia. 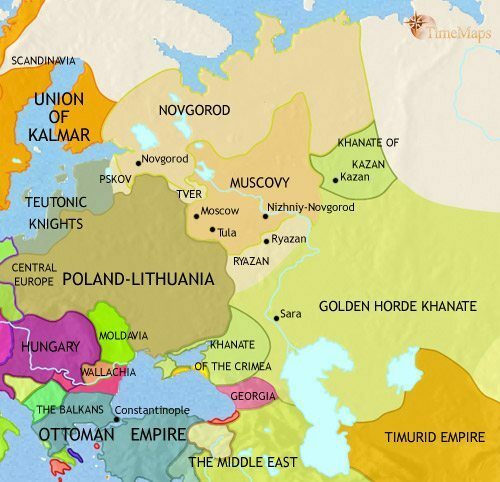 The Russians’ western neighbour, Poland-Lithuania, has been able to take advantage of the Russian princes’ subordination to the Golden Horde by expanding far into their territory. However, by this date the Golden Horde is in decline, with independent khanates being established in the Crimea and Kazan. Under Ivan the Great (1462-1505), Muscovy expanded hugely at the expense of its neighbours, annexing Novgorod (1478) and taking much territory from Poland-Lithuania (1493-1503). Ivan successfully asserted his independence from the Golden Horde (1480). He took the title Sovereign of All the Russias (1497) and adopted the additional title of Caesar, or Tsar. Ivan’s successors continued the expansion of Muscovy. However, in c. 1560, Ivan IV (“The Terrible”, reigned 1533-84) began a reign of terror. By his death he had eliminated all other members of the royal line, and the nobles had to elect one of themselves, Boris Godunov, as Tsar. Unfortunately, his rule was engulfed by revolt and foreign invasion, and Muscovy descended into chaos. Eventually a group of nobles elected a new Tsar, the 16-year old Michael Romanov (1613). His ministers set about restoring stability, peace and prosperity, a task in which they largely succeeded. Alexis (1645-76) now reigns as Tsar. The decline of the Golden Horde has allowed a great movement of Russian peoples eastward into Siberia. Under Ivan the Terrible, the new territories are populated to a great extent by people fleeing his persecutions. Not far behind the migrants are the Russian authorities, imposing some kind of control over the new territories, but this is a much less onerous style of rule than in the Russian heartlands. Tsar Alexis (1645-76) oversaw the “liberation” of large tracts of the Ukraine from Poland-Lithuania. After Peter the Great’s reign, factional strife at court led to a series of short, weak reigns until the empresses Elizabeth (ruled 1741-61), and Catherine II, “the Great”, (1762-96) consolidated his reforms. In particular, they called into being a loyal and competent administration, and centralised the government. 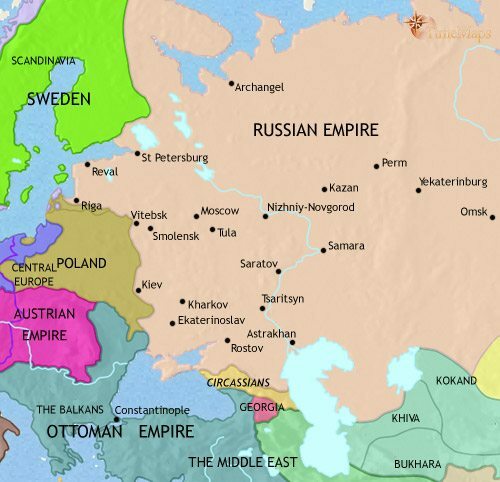 Under both empresses, Russia’s borders have expanded at the expense of the Ottoman empire, Poland-Lithuania (especially in the First Partition of Poland in 1772), and the Crimean Khanate. Tsar Alexander I (1801-25) was intent on further westernisation and liberalisation. His plans for reform, however, had to be put on hold by the war against Napoleon. Because of its crucial role in defeating Napoleon, Russia’s prestige soared, and since 1815 it has been seen by many as the leading power in Europe. After the war, Alexander’s attention turned to creating an international order that would protect the world from revolutionary movements. His son, Tsar Nicholas I (1825-55) is even more intent on stamping out revolution in Europe and protecting Russia from corrupting foreign influences. He is known as the “Gendarme of Europe”. Abroad, Georgia, hard pressed by Caucasian tribesmen and Persian aggression, voluntarily submitted to Russian rule (1801). The annexation of Georgia led to Russian involvement in the Caucuses, which has gradually, but with difficulty, been falling under Russian control. Far to the east, the Russian-American Company, set up in 1799, has established trading settlements in Alaska. In 1848, Nicholas utterly opposed the liberal revolutions in western Europe, and sent in troops to neighbouring Hungary to help the Austrians stamp out the revolution there. Russia’s defeat by Britain and France in the Crimean War (1854-6) led to widespread unrest at all levels of society, and the government of the present Tsar, Alexander II (1855-81), has carried out many reforms. Most notably, the serfs have been emancipated. But these measures, though well-intentioned, have been too little and too late for some. Revolutionary ideas are spreading in Russia, especially amongst the young members of the educated middle classes. 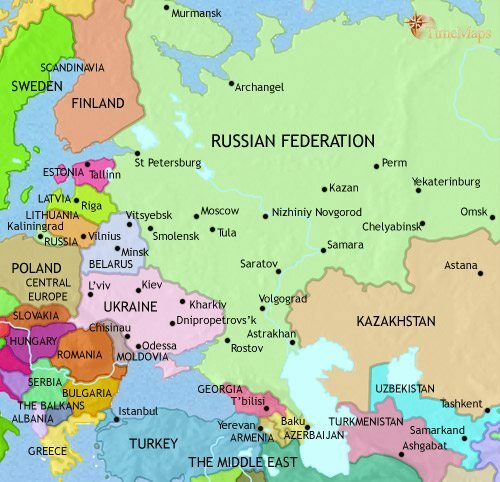 Russia’s borders have been pushed deep into Turkish territory around the Black Sea and into the Caucuses – though the Chechens and Circassians continued to hold out for many decades before annexation. In central Asia, the systematic annexation of Turkestan has begun. Much further east (or west, depending on one’s point of view), the Russians have sold Alaska to the USA (1867). At home, Russia’s industrial base has been growing at an ever-faster rate. At the same time, the mounting strength of revolutionary movements is signified by the assassination of Tsar Alexander II in 1881. The accession of the conservative Tsar Alexander III (1881-94) leads to the harsh suppression of revolutionary organisations, and policies aimed at the full restoration of autocracy. Alexander’s reign also sees widespread persecution of the Jews. Alexander is succeeded by Tsar Nicholas II (1894-1917). Russian expansionism in the Far East leads to the Russo-Japanese war of 1904. This is disastrous for Russia, which is defeated by Japanese nerve and technical superiority. The defeat of giant Russia at the hands of tiny Japan is a national humiliation, and is followed by industrial strikes, peasant unrest, and mutinies in the army and navy. Demands for large-scale reform come from all quarters. A parliament, the Duma, is called, but it can only discuss problems, not legislate. The revolutionary activity of 1905 is followed by a period of repression. Under the ministry of Peter Stolypin, some much-needed reforms are carried out, including land reform to aid the newly-freed peasants, and a dramatic expansion of the education system. Stolypin is assassinated in 1911. Russia entered World War 1 on the side of Britain and France; however, the Russian Revolution of 1917 led the new Bolshevik (Communist) government to sign the Treaty of Brest-Ltovsk with Germany, taking Russia out of the war and giving away huge tracts of land to the enemy. The Russian Revolution was followed by several years of civil war, which the Bolsheviks (now renamed the Communists) eventually won. Russia was now the first communist state in the world, a massive experiment in how communism might transform society. Lenin died in 1924 and power passed to Joseph Stalin. Stalin’s drive to apply communism by industrializing and collectivizing the economy of the Soviet Union (as this communist manifestation of the Russian Empire was called) caused millions of deaths amongst the peasantry. His bid for complete control over the party, government and army led to wave after wave of purges of senior and middle-ranking officials and officers. The Soviet Union suffered enormously during World War 2, with perhaps 20 million lives lost. But it survived as one of the two post-war superpowers. Stalin died in 1953 and was succeeded by Nikita Khrushchev. Under Khrushchev, things improved for the Russian people, but Soviet armies now occupy most of Eastern Europe, and it has imposed tight control over its satellite nations there. In 1955, it established the Warsaw Pact, to counter NATO.